Thank you to all who left such flattering comments on Monday!! I am glad you like the walls. My daughter is so pleased and her friends that came over thought they looked fantastic. Now we just need to add the finishing touches on the space, art work and drapes. His stripes were actually wallpaper, but since we are renting, wallpaper is out. What better way to add a bit of character to my daughter's space than a striped wall. I am glad no one notices the "mistakes", my husband had fun pointing them out a few hours after the tape came off. Little does he know, the next time I decide I want stripes on the wall, he is helping! A few of you commented that you liked the "black and white" stripes, when in fact the colour is a deep rich brown called Black Bean Soup by Benjamin Moore. The photo doesn't do the colour justice. I guess it is almost black but not quite. I love the look of the brown and white. As a matter of fact, it is such a crappy photo - the high ISO setting on my non SLR camera makes the photos grainy. I was also asked about how I painted the walls, what tape did I use, etc. That deserves a post of it's own, so hopefully I can get my act together tomorrow and write up my tips. Another question asked was, where I did I find the "Rub'n'Buff" that I used on the hardware of the dresser? I couldn't find it at Michaels or Home Depot. After looking online, I found it at my local art supply store, Opus Art and Framing. Opus can be found in various locations throughout the Greater Vancouver area. I also found it here. 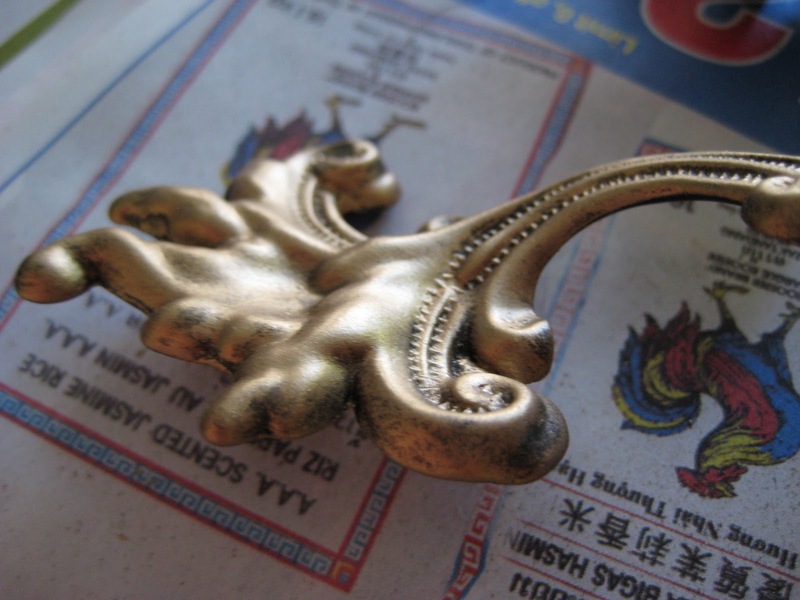 It comes in many metallic finishes and I used "Antique Gold". This stuff if amazing. I used an old toothbrush and rag to rub it on and buff. You only need a minuscule amount. A little goes a long way. The possibilities with this stuff is endless. 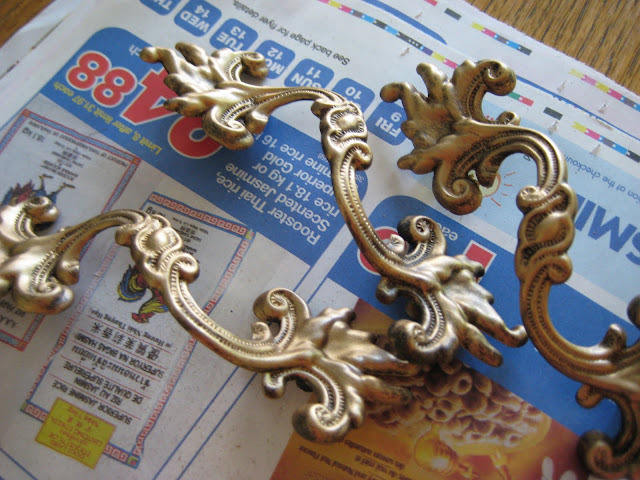 I also gilded a few frames, which will be part of the gallery wall! Have you ever used this? If so, what did you use it on? Looks great! I've used Black Bean Soup before - isn't it a cool colour?? So much to it! That Rub'n'Buff looks interesting too, I've never heard of it - thanks! Of course I am partial to stripes! Yours look great...can't see the mistakes and I am sure if there are some you won't notice after the room is put together! I am just dying to use rub & buff on something - must get some ASAP! The walls look fabulous. I do not see any mistakes! I love the striped walls! And brown is such a fresh take. Must look much softer and warmer in real life. Good choice!! Looks Great Barbara! You 're Daughter must be so excited. Oh you tease. I thought for sure we were getting the full tour today. Come on now! Maybe we can stop at Opus next week 'cause I've been looking everywhere for this stuff. 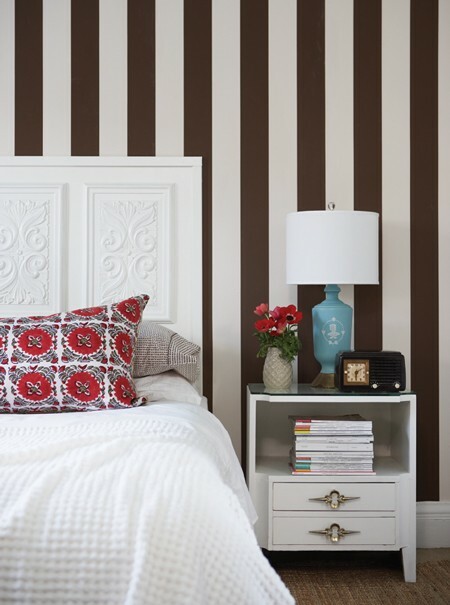 Love the BROWN and white stripes. Color perception is so dependent on lighting. Just like how you have to select a shade or two lighter from your preference on a color sample--when stroked across an entire wall, the impact is usually much bolder and darker to the eyes! So talented you are Barb and it looks pretty perfect to me! Good colour choice - much softer than black. When I saw the brown and white stripes I was thinking they looked so good that I wished you'd done brown instead of black-wish come true! You did a great job, I don't see any mistakes. I did a big tedious job recently with Rub 'n Buff. I too had a hard time finding it at Michaels, well, the color that I needed they were out of. I used "gold leaf" for my project. Thanks so much for using AMACO's Rub 'n Buff. Your handles look amazing! So glad the gold worked for you. If you ever have trouble finding the product again let me know. We also have all 16 colors available for purchase from our website if that helps you.